I made these burgers today and I'm super pleased with them. Yes, I have veered off my meal plan already. We were supposed to be having Pasta with Roast Vegetables and Feta tonight and going out for a meal tomorrow, but the meal has been cancelled, so with a day off and a bit of time on my hands (after cleaning the house from top to bottom), I decided to make us some lovely homemade burgers. I'll go back to the plan tomorrow, starting with the pasta. 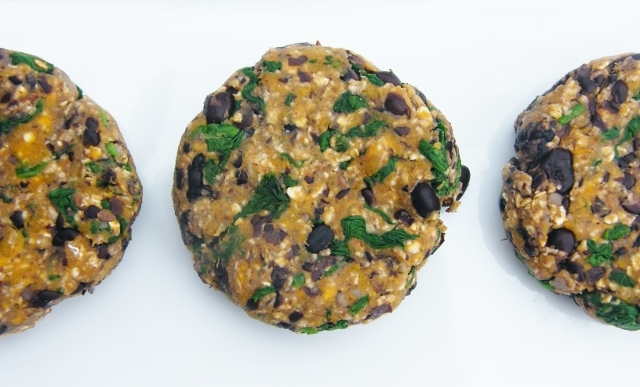 My burgers are made with sweet potatoes, black beans, spinach, oats and seeds. No egg or any kind of dairy, so they are suitable for Graham to enjoy too. I spiced them with some Schwartz spices. I chose the Cajun spices for this burger and it really adds a lovely bit of flavour and heat. I added 2 tsp of spice to my burgers, but if I was making them for just Graham & myself and no little tums, then I would maybe even add another spoonful for a really spicy kick. I picked up a couple of jars of Schwartz spice mixes. The Cajun mix and Season-All, which has paprika, black pepper and celery seeds. Not sure what I'm going to use the Season-All for yet, but it is quite interesting to buy a mix and to get ideas for new combinations. I tend to use the same spices over and over. Cumin, turmeric, ginger, chilli and black pepper get used heavily in my kitchen, probably too heavily, so it's time to mix things up. I notice from the Schwartz website that they add spice mixes to their slow cooker recipes and I had a look at their lasagne recipe too . Their lasagne wasn't suitable for vegetarians, like my veggie lasagne is, but it was interesting to see the spice mix they add. I'm going to have to try that. I enjoyed my burger for a late, late lunch on a toasted poppy seed roll, spread with wholegrain mustard, topped with a bed of salad leaves, then the burger and finished off with a few slices of lemon dipped avocado. It was the best burger I've had in a long, long time! In fact one of the best ever! I hope Graham and Cooper love them as much as I do and I hope you give them a go too. Such an easy recipe, but top class results. 1. Rinse the beans and add them to a mixing bowl. Mash, but leave half of the beans whole for a bit of texture.2. Scoop the flesh out of the baked potato with a spoon and add to the bowl.3. Rinse your spinach in a colander then pour a kettleful of boiling water over it to wilt it. Rinse with cold water to refresh, then squeeze as much water out as you can. Chop and add to the bowl.4. Next add the seeds, oats, spices, garlic and black pepper and mix until well combined.5. Shape your mixture into 4 hearty balls, then flatten out into burger shapes.6. Pop the burgers on a plate until you are ready to use them. You can bake or fry them in a little oil. I fried my burger in a little cold pressed rapeseed oil, for a few minutes on each side until brown and crisp.7. These burgers will also freeze well. Layer them between sheets of greaseproof paper in a tupperware tub and pop in the freezer.8. Enjoy! I am entering my burgers into Credit Crunch Munch hosted this month by my good friend Janice over at Farmersgirl Kitchen. The event was set up by another two of my good friends, Helen from Fuss Free Flavours and Camilla from Fab Food 4 All. My burgers might not immediately seem to be frugal, but the black beans were sitting in my cupboard, the spinach was nearing the end of it's vacation in my fridge, as was the sweet potato and the oats and seeds, I have for Cooper's breakfast porridge. I am also linking this up to Ricki's Wellness Weekends. Disclosure: This recipe was developed on behalf of Schwartz. I was not expected to write a positive review and any opinions expressed are my own. I love the combination of black beans and sweet potatoes, though I've never combined them in a burger. What a great idea! Looks and sounds delicious. I love a good veggie burger Jac, and these look amazing. Great photos too! Thanks Helen, they are exceptional! I wasn't that happy with the final burger shots, but at least I got good light. My husband gave these 10/10 and said they were the best burgers he has ever tasted! He doesn't enthuse much usually! Yummy! Do you remember where you bought the tinned black beans from? I've been looking for them, but have only found dried ones. Yes, I had trouble finding them too, but found them in a big Tesco in the world food section. Brilliant Anne, what a nice time for you. I am sure he will like them. Graham is raving about them. If he likes spice, add another spoonful. Yum, yum yum!! I love Cajun and sweet potato dishes and this looks wonderful. I'm lucky in that I've been able to find black beans lately, so happy as they're great in so many things. Nice addition of seeds as well. Thanks Emma. It took me a while to track black beans done, but I'm glad I did. They are pretty special. That is easy done Camilla. I do hope you try this recipe. Indeed and a tasty one. Thanks Ricki, in a way it is hard work to figure out your meals, but then if is so much easier during the week. Looks great and it is lovely to have time (I often go through so many ideas for what will be for dinner before I make it which is why I am not sure about meal planning). interested the you have both flax seeds and linseeds in the recipe - in Australia flax seeds are called linseeds (though "flax seeds"is becoming more popular). These burgers would be great with a bit of nutritional yeast flakes and some lemon juice for a slight cheesy taste. Haha, that shows how much I know. I bought the flax seeds and brown linseeds in the same health shop and didn't realise they were the same, although one is slightly ground. So funny! I did think about adding nutritional yeast, but wanted to keep the flavours pure this time. I have been using it to make Graham cheese sauce though. OMG these burgers look delicious!!! These look delicious and very hearty, I will definitely try them.Adding sweet potato must have given them a natural sweetness.Such a mouth watering click. You could always try this with kidney beans, but I think it is better with black beans. 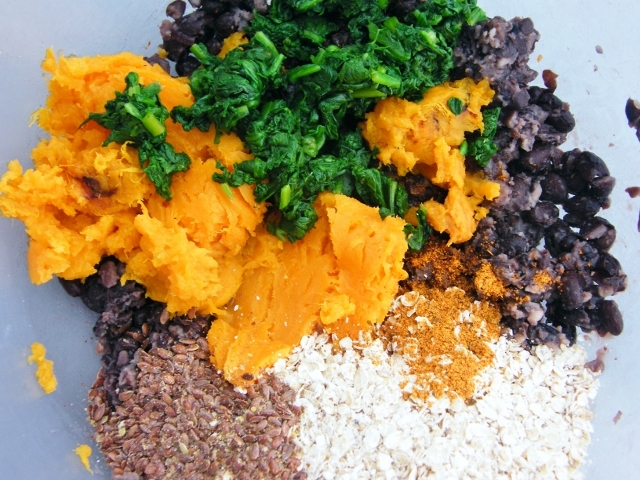 I love the idea of using sweet potato and spinach to bind it all together. Genius! I'll have to give that a burl at home this weekend. I'll have mine with avo please! It was good with the avocado Tandy & would an even better contrast if the burger was really spicy! 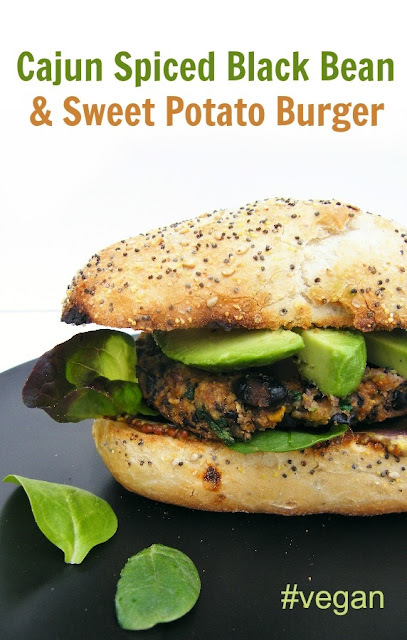 I have made black bean burgers in the past and love it...have not made it with sweet potatoes, and spinach included in the mix; yumm! ...and oh, yes, always, always use (d) Cajus Spice to liven up the flavors! Will try your recipe for sure...thanks for sharing! See the cajun spices are new to me Elisabeth. I don't know why, but I never buy mixes. I am won over now though. Love all the ingredients in this burger...it looks flavorful and super delicious. Thanks Pam, I was really pleased with it. Looks so good! I do something a bit similar with cooked quinoa, but you are keeping it a bit Scottish (and more storecupboardy) with the porridge oats. I'm sure they freeze well too. I have been meaning to make burgers with quinoa, but I haven't gotten around to it yet. I really must. Might have to ask for tips. I used this recipe last night and they really are delicious! Thanks for the recipe! I always thought flax seed and linseed were the same thing?? You are so right, I didn't realise, not helped by the different colours. Should change the recipe now. I don't see where to add the oats and should they be cooked in any way first? Thanks! Whoops! You are so right. Well spotted, I have added them into the recipe. No don't cook them, just add them in plain at the same time as the seeds. Thanks! We had these tonight with low-carb wraps instead of buns and topped with whole grain mustard. They were absolutely delicious and can't wait to have them again! Thanks for sharing this recipe! I made a version of these today, switching sweet potato for butternut squash and cajun spice for chipotle paste - they were excellent, and held together better than any other veggie burger I've tried. Thanks for the recipe! What a great variation and yes they do hold their shape well. Potato is an excellent binder for veggie burgers. I'm glad you loved them as much as we do. Hello! I'm a student at the New England Culinary Institute in Montpelier, VT, USA. I found your recipe through Yummly.com and we made it for lunch today. It fed over 200 people and was a huge hit! Your burgers got many compliments and I wanted to thank you. I'm new to your blog, but I just started following you on Bloglovin. I can't wait to go through your other posts! I made these burgers after seeing them in Vegetarian Living magazine and they are fantastic. None of the difficulties of some veggie burgers (e.g. falling apart or sticking to the pan) and so tasty. I am so glad you liked them, they are favourites in this house and yes, sweet potatoes make a great binder. You have had more luck than me finding a Vegetarian Living this month. I have tried in about 7 supermarkets only to find an empty shelf. Just ordered a copy online. Thanks for taking the time to comment, it's always lovely to hear how people get on with my recipes. These were delicious. 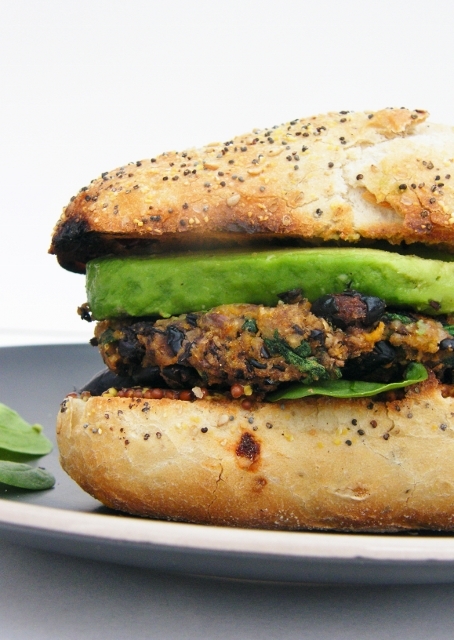 The best veggie burger recipe i have tried. I know that these will become a regular fixture in my household. Thank you! Whoop! Whoop! We think so, but it is lovely to hear that you feel the same. Thanks for taking the time to stop by. You made my day! Love this recipe! We make a double batch almost every week to have throughout the week. So yummy, versatile, and easy. Good in corn tortillas, on buns, or alone with a side salad. Yummm. THANK YOU so much for posting this healthy, easy recipe! Portland Fresanero sauce in mayo and Irish Cheddar cheese are the perfect compliments. Thanks for taking the time to stop by Barb. I am so glad you enjoy the burgers. We love them too. Some nice serving suggestions there. Really nice post, keep up the good work. I could use a bit of help from you, since I'm living in Glasgow at this point of my life. I don't know if you do too but in case you're familiar with the city, could you recommend a place to buy such nice burger buns as the ones used in this recipe (or any decent bakery, for that matter)? Hi Tommy, I could recommend places to eat, but no idea about a good bakery as I don't get over to Glasgow very often. I think these were just from a supermarket bakery if I remember correctly.